Mark Calabria of the Cato Institute provides a very civil critique of my article in the National Review. He raises three key objections to my arguments in the article. I will address each one in turn. [Beckworth] argues that spending is far below trend. That is true enough as it goes, but this trend includes a massive housing bubble, where imaginary wealth fueled spending, aided by massive borrowing from abroad. The objective of our economic policies should not be to get back to the top of the previous bubble. It was this desire to replace the lost wealth of the dot-com crash that contributed to the Fed’s juicing of the housing market. All that said, consumption today is higher than at any time during the recent bubble. 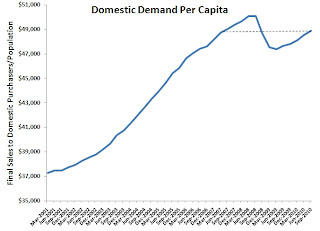 The primary problem facing our economy is not a lack of demand. I never argued in the article for a return to a bubble-driven economy, only to a stable total current dollar spending level. Such an objective, which could be achieved via a NGDP level target, does not require a return to debt-fueled consumption and asset bubbles. As I note in the article, all it requires is for creditor households, firms, and banks to simultaneously reduce their demand for money. There is no need for debtors to incur more debt here. Given the excess capacity and sticky prices, the resulting increase in nominal spending by creditors would occur without new asset bubbles emerging. Asset bubbles typically emerge when market interest rates are held below the neutral interest rate level. This happened in the early-to-mid 2000s; it is not happening now. Interest rates are low now, but so is the neutral interest rate given the weakened state of the economy. I cannot see anything but a demand problem in this figure. Given the Fed has significance influence over nominal spending, the incredibly slow recovery in this figure also indicates monetary policy has been too tight. Beckworth believes we have had no inflation. Again like the Fed, he arrives at this conclusion by subtracting out of the inflation numbers all the things that real people spend their money on, such as food and energy. 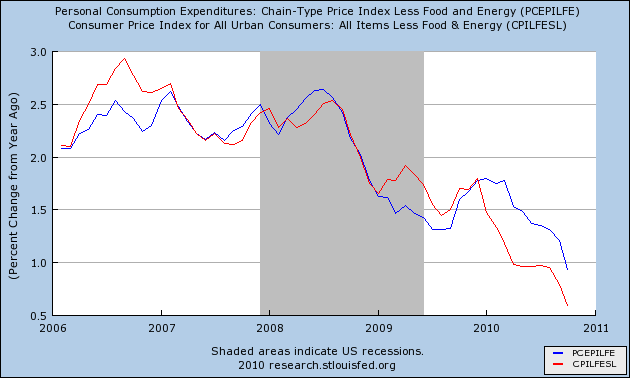 I would not claim we are facing hyper-inflation, but two facts should be borne in mind. First, over time even low levels of inflation erode away wealth; and second, a large surge of inflation is likely to occur quite suddenly, without giving the Fed months or years of warning. If that were not troubling enough, market-based measures of expected inflation had been heading down all year up until the Fed started promoting QE2. Had the Fed not done QE2, then inflation expectations at their existing trend would have become deflationary by mid 2011. Now inflation expectations are important because they provide a proxy for expected nominal spending (assuming no big changes in productivity). Thus, the decline in expected inflation was effectively a decline in expected nominal spending. And of course, expectations of future economic activity help shape current economic activity. Thus, by allowing these expectations to deteriorate for so long, the Fed was effectively tightening current monetary policy. Finally on this second objection, Calabria's concerns about inflation suddenly exploding and catching the Fed by surprise is really not an issue. This was a problem in the past, but not now because we have real-time, market-based measures in the TIPS market. [Beckworth] fails to consider that households may not be “hoarding” cash by choice. After all, most of us still have our cash in banks, even if in transaction accounts. The money hasn’t been stuffed under the mattress. In fact, throughout this recession and financial crisis, the amount of insured deposits has been consistently increasing. We are nowhere near a 1930s style disintermediation of the banking sector, which greatly contributed to an actual decline in the money supply during the Great Depression. Most market participants, me included, would be happy to put their money into valuable investments. Yet with interest rates near zero, there’s little incentive not to hold cash balances, as the opportunity costs are nonexistent. This last paragraph is way off. If Calabria read the article he would know that (1) I said firms, banks, and households had elevated money demand not just households and (2) nowhere did I say that excess money demand means stuffing money under one's mattress. Obviously, firms and banks can't stuff money under their mattresses! Excess money demand is evidenced by the increased holdings of cash and other highly liquid assets held by creditor households, firms, and banks as seen in the graphs at the bottom of this post. Calabria even acknowledges this is happening in the above paragraph when he mentions the growth in deposit-insured accounts, but somehow gets hung up on cash under the mattress. The key to excess money demand is not where it is located, but that it is not being spent. 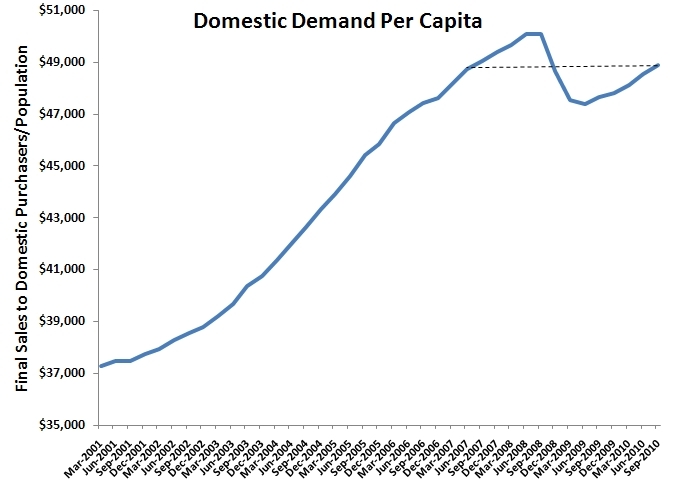 (For a fuller treatment of the excess money demand problem see here.) And all the evidence indicates there are still excess money balances not being spent. The fact that Fed has allowed this to occur amounts to an effective tightening of monetary policy. Finally, the whole point of QE2 is to raise the opportunity cost of holding money! 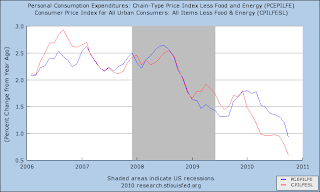 That is what the Fed can do by raising expectations of inflation and future nominal spending. Yes, QE2 could be done in a more rules-based approach. On that point I am sympathetic to John B. Taylor and Rep. Paul Ryan's call for a more systematic approach to monetary policy. I just ask that nominal GDP level targeting be given a hearing as the monetary policy rule for reasons discussed here and here. Update: Here is a figure of velocity from an earlier post. 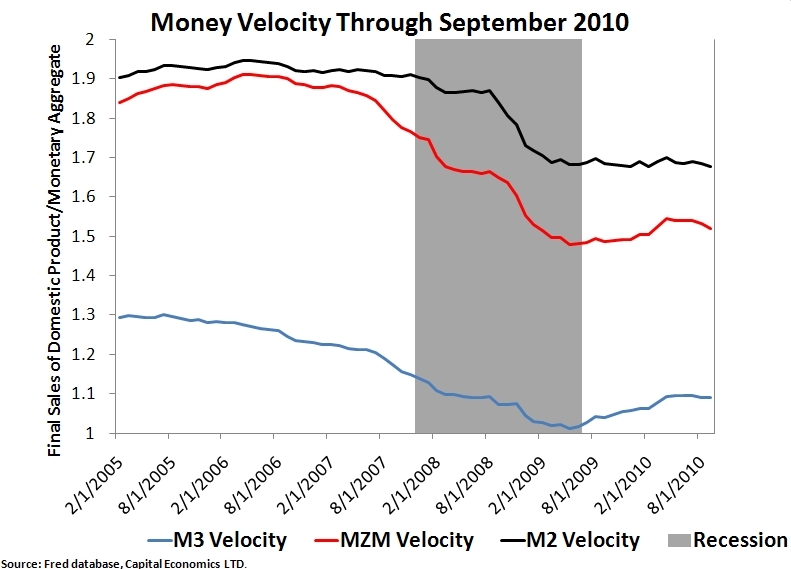 This figure also points to an ongoing excess money demand problem. Looking at the slopes of your three graphs over the last year makes me wonder why anyone thinks we are in recovery. 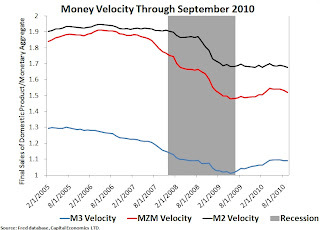 Demand, though up, is at a slope far below trend; core inflation still looks like it's heading negative soon; and money velocity has bounced like a dead cat. Maybe things stopped getting worse for a while, but they sure aren't getting much better. It behooves the economics profession to think seriously about a job guarantee program and vigorously advocate it, along the lines suggested 2 decades ago by the Nobel economist, William Vickrey. There has to be a saner, more civilized and morally justifiable way to organize an economy than the path that has evolved these past 30 yrs. Mr. Calabria says "First, over time even low levels of inflation erode away wealth." I've been sitting here trying to imagine what kind of wealth is eroded by inflation. Perhaps he means wealth stored in a bag under your bed. Or, perhaps he means wealth invested in short selling dollars. Certainly, not wealth invested in things, whose price would be expected to increase along with the price of all other things. The one thing inflation erodes is wealth loaned at interest rates not tied to the rate of inflation. Put another way, inflation erodes debt. I think the country could use some good debt eroding right now. I haven't quite got my mind around it yet but I suspect that the delay in the recovery is a result of lenders not wanting to take their lumps on bad real estate loans. The Banks are delaying the final resolution of their bad investments, i.e. they're delaying the sale of the real estate, hoping that prices will recover and rescue them. The banks have gotten the Federal Government to loan them money so that they can delay. As a result the bad real estate investments the banks made have not been resolved and they're just sitting there clogging up the system of borrowing and lending. Had these investments been made in any other type of business the losers would have taken their lumps and the winners would have taken their winnings and the economy would have moved on. In this case the winners are the homebuyers who, in effect, sold the banks futures on the value of their homes. The price of the homes went down and the homeowners ended up with the money they borrowed from the banks and the banks ended up with title to a property worth less than the amount loaned. The banks are trying to delay the final settlement date while they figure out some way to keep from ending up the losers in this situation. The homeowners are waiting for the banks to follow through on the sale of the commodity so they can buy the homes back at their new reduced price. I think people are having difficulty seeing this because it seems to be a violation of one of the fundamental laws of the Universe, i.e. the big guy always beats the small guy. In this case the small guy homeowners have, unwittingly perhaps, outwitted all those Harvard MBAs working for the banks. I would imagine stuff like this happens in the commodities markets all the time, but the law, I again imagine, requires the contracts to be settled quickly, otherwise the commodities markets would stop functioning. That's what is happening here, the market is not functioning. Dr. Beckworth broke a current right-wing rule by saying the words "aggregate demand." To many people at Cato (and in Austrian economics) and "supply-siders" those are fighting words, hence Calabria countered by essentially calling him a Keynesian. We've seen this over and over again in the last couple years, and it's sad. Milton Friedman would be a Keynesian in the eyes of these people. Why the Surge in Commodity Prices? What if the PIGS Had Never Adopted the Euro? Yes Tyler, Low Interest Rates Mattered Alot.